1. Drain the chickpeas and rinse well. 2. Drain again and transfer to a deep pan. 3. Add some water, black tea bags and cardamoms. 4. Place over medium flame and simmer for 30 to 40 minutes until the chickpeas are soft. 5. Drain the chickpeas again, reserving about 2 to 3 cups of water. 6. Discard the tea bags and cardamoms. 7. Combine the pomegranate seeds, mango powder, ginger garlic paste, green chillies, salt, coriander powder, red chilli powder, turmeric powder and garam masala powder in a blender. 8. Add about 1 to 1 1/2 cups of water and blend to a smooth paste. 9. Heat a pan over medium flame. 10. Add the chickpeas and the ground paste. 11. Mix well and keep aside. 12. Heat ghee in a small frying pan. 13. Saute the onions and bay leaves until onions turn golden brown. 14. Add tomatoes and saute well. 15. Add this to the chickpeas along with the reserved water. 16. Bring to a boil and cook till the gravy has very little water. 17. Garnish with some chopped onions and coriander leaves. 18. Remove and serve hot with rice, roti or naan. 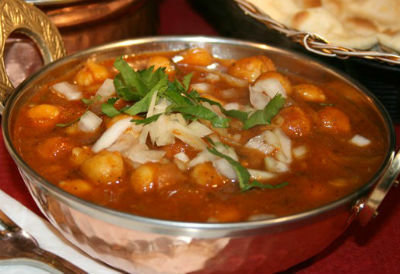 Feel free to comment or share your thoughts on this Amritsari Chole Recipe from Awesome Cuisine.